The UC Santa Cruz Farm & Garden’s annual Spring Plant Sale will have a 50th Anniversary flavor this year, featuring some of legendary gardener Alan Chadwick's favorite plants. The sale offers the region’s largest offering of organically grown vegetable, herb, and flower starts, along with a wide variety of landscape plants. The Spring Plant Sale takes place Saturday, April 29, and Sunday, April 30, in the Barn Theater parking lot at the base of the UCSC campus, near the intersection of Bay and High Streets in Santa Cruz. The sale will be open on Saturday from 10 a.m. to 3 p.m., and on Sunday from 10 a.m. to 2 p.m. On Saturday, members of the Friends of the Farm & Garden can enjoy a “members’ hour” starting at 9 a.m. (new memberships and renewals are available starting at 8:30 a.m.). The event also hosts a free seed exchange sponsored by UCSC’s Demeter Seed Library on Saturday from 10 a.m. to 2 p.m. You’ll find free open-pollinated and heirloom seeds to grow out for your own garden and to share with the library. This spring marks the 50th anniversary of Chadwick’s arrival at UC Santa Cruz, where the British master gardener introduced his signature approach to organic, raised bed gardening at UCSC’s Student Garden Project (now the Alan Chadwick Garden). For vegetable growers, this year’s sale will feature a great selection of tomatoes and peppers (sweet and hot), including the signature ‘Chadwick’s Cherry Tomato’, and his favorite lettuce, ‘Kentucky Bibb’, along with eggplants, Asian greens, summer and winter squashes, pumpkins, leeks, a wide variety of basil, cucumbers, kale, and more. Flower lovers can choose from an array of annuals perfect for homegrown bouquets and landscape plantings. This year’s offerings include bachelor’s buttons, cosmos, hollyhocks, stock, zinnias, and sunflower varieties. Also available are particularly water-thrifty options, including poppies, marigolds, snapdragons, statice, strawflowers, and cosmos. Among Chadwick’s favorites featured this year are perennial landscape plants that also make great cut flowers for bouquets. The roses ‘Buff Beauty’, ‘Penelope’, and ‘Will Scarlet’ will be available, along with Veronica spicata ‘Chadwick’s Especiale’, woolly lamb’s ear, and flowering tobacco. Other popular landscape plants include a selection of salvia, lavender, and rosemary, and marjoram varieties. Look for butterfly bush, delphiniums, lemon balm, coral bells, Ribes, and gerbera daisies, along with kangaroo paws and yarrow. Several blackberry and raspberry varieties, including golden raspberry, will also be available. Many of the perennials will be priced at a special rate of 3 for $20 in gallon containers. 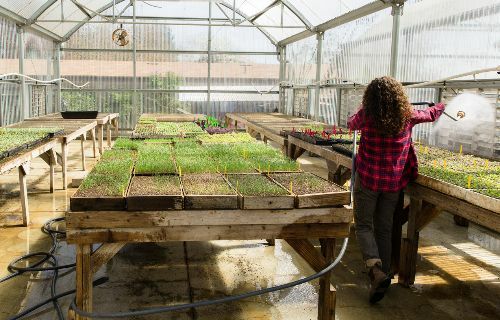 The Spring Plant Sale proceeds help support the operation of the UCSC Farm & Garden and the Apprenticeship in Ecological Horticulture, a six-month training course in organic farming and gardening. Members of the Friends of the UCSC Farm & Garden receive a 10% discount on purchases.